Japanese Level 5 (30, 30-min. daily lessons + Reading Lessons) Mobile app with interactive learning and review tools teaches speaking, understanding, and reading. Modified version available for desktop. The thirty 30-minute lessons, plus the reading practice, will enable you to speak and understand with near fluency and with a broad range of conversational skills. In Level 5 the pace and conversation moves quite rapidly, accelerating exposure to new vocabulary and structures, approaching native speed and comprehension. You’ll learn to speak more in-depth about your personal life and emotional state, and be able to create complex sentences using a mix of tenses and moods. Reading Lessons are included to practice reading Hiragana and Katakana alphabets, plus learn to recognize and "read" some Kanji characters of familiar words. Reading lessons are included and will build upon the language skills acquired in Levels 1 through 5. These lessons are designed to deepen your memory and understanding of learned vocabulary, as well as to begin the work of connecting the words and phrases that you've learned to the Japanese writing systems. Japanese has many “registers” or levels of politeness. 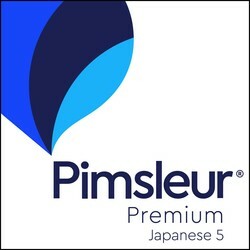 Throughout every level of your Pimsleur course, you will learn how to speak at a polite register, which is appropriate in virtually any situation you are likely to encounter in Japan. In Level 5, you will continue to learn some ways of speaking in a less formal manner, used in conversation between friends, family members, or colleagues who are at the same level in an organization.